The popularity of fashion and textiles continues to grow, fuelled by exhibitions such as Versace at the Victoria and Albert museum in London, and Sybil Connelly at the Hunt Museum. Sybil Connelly, who died at 77 in 1998, popularized Irish fabrics like tweed, poplin, lace and linen by softening their colors, their textures and their construction. 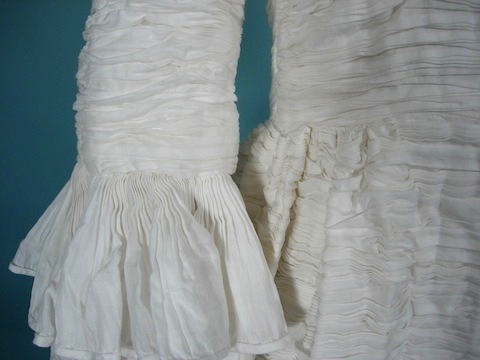 Today, Sybil Connelly pleated linen dresses from the 50s and 60s are harder to come by than Dior at auction houses. and Jackie Kennedy. Jacqueline Kennedy was actually painted for her official White House portrait wearing one of the designer’s pleated linen dresses. Connolly's success started with a red flannel petticoat, the much-lauded "Irish Washerwoman Look" so popular in NY in the 1950s. Pleated linen and easy elegance remains her indelible emblem. "You have to decide," she once said, "whether you want to create the beautiful or the merely fashionable." 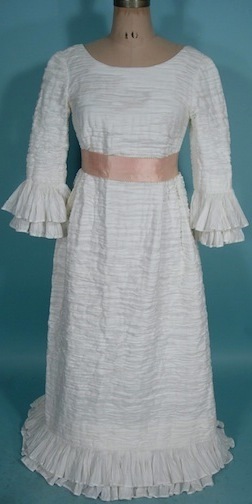 Sybil Connolly made her public debut as a designer in 1952. And by the following year, her gown was featured on the cover of August 1953 Life magazine, with the title, ‘Irish invade Fashion World’. Her ballgowns were also photographed by Norman Parkinson for the July 1954 edition of Vogue. In a Saturday Evening Post profile of the designer in November 1957, it was noted that three-quarters of her gross earnings (then estimated at $500,000 per annum) originated in the United States. By the end of the 50's she employed around one hundred women, half of them working from their own homes where they wove tweed or hand-crocheted lace. She wisely used the fabrics of her own country, in particular linen at its lightest. She used to say that she first discovered this featherweight weave in a Northern Irish factory where it had been manufactured many years earlier to be made into fine linen handkerchiefs for the monarchs of Europe, but that after the First World War ‘there weren’t enough of them left around.’ Famously, she took this linen and had it closely pleated to produce lengths which might then be used for dresses and skirts. 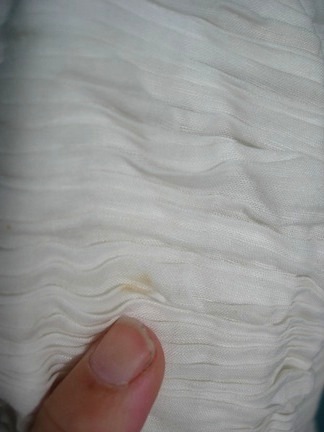 Nine yards of linen were needed to create one yard of finished material. 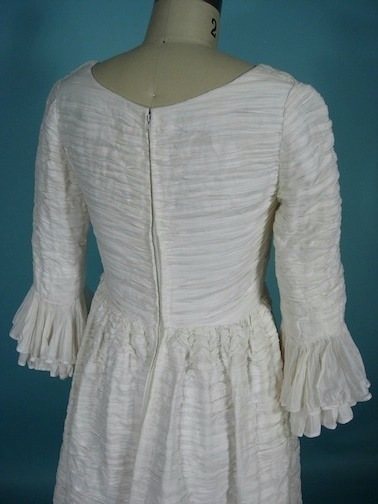 The first piece made in this way to be shown in the United States, a white evening dress called First Love, using three hundred linen handkerchiefs and containing more than five thousand pleats caused a huge stir and helped to make her name among Americans. 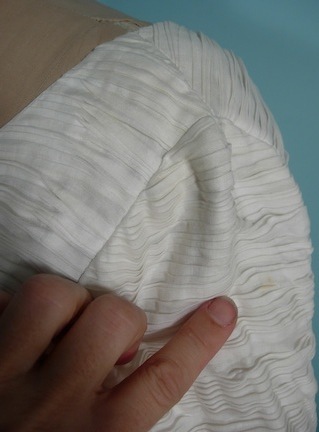 It would take five weeks to make a pleated linen dress. Exclusivity was one advantage of this long production process. In March 1955, she told the Los Angeles Examiner that her work was rarely copied ‘because of the individual handwork that is done on them. 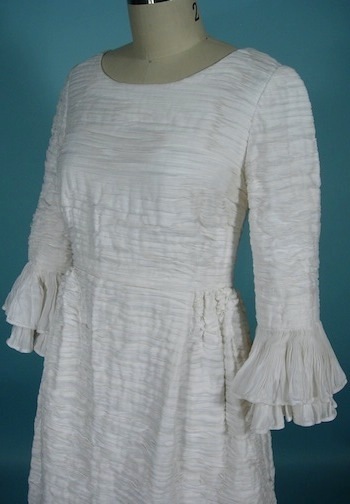 The fabrics are all handmade in our cottage industries.’ She often gave her clothes Irish names and a strapless pleated linen evening dress by Sybil Connolly was shown in the New York Times in April 1954 selling for $300 and prices remained largely unchanged over the next few years. The greatest merit of her pleated linen was that garments from which it was made were almost uncrushable. Harper’s Bazaar noted in June 1958 that a Connolly pleated linen skirt ‘will pack into a small duffel bag and emerge unscathed.’ Sybil Connolly’s pleated linen is as remarkable a contribution to fashion history as Mario Fortuny’s Delphos pleated silk dresses made at the beginning of the 20th century and like them will forever be associated with the name of one designer. Sybil Connolly deserves to be remembered in Irish history for more than just her designs. She was the country’s first fashion designer to attract international attention, the first woman in Ireland to set up her own successful business selling overseas, and one of the first people to promote Irish products and skills in the global market. She was one of the most remarkable women in Ireland in the 20th century.